1A movement is beginning within the field of public administration to reexamine the role of the public in public decision making by looking at ways of engaging citizens more directly in public deliberation about community problems. But, this is not yet being reflected in the curricula of graduate programs in public administration. Seeking to address a societal need for public managers with the will and skill to design and facilitate participatory public processes, the Department of Public Management at Suffolk University in Boston has developed a concentration in community leadership and public engagement for students in its Master’s in Public Administration Program. This paper outlines the rationale for such a concentration and provides an overview of the new program. 2Current American views about the role of citizens in public decision making have drawn on three currents of thought: bureaucratic expertise, democratic deliberation, both within legislative bodies and at the local level, and utilitarianism – but, in unequal parts (Reich). As government has grown, its legitimacy has rested on notions of bureaucratic expertise and adherence to hierarchy, law, and procedures. More recently, the public interest has come to be defined by responses to opinion surveys, people’s willingness to pay for certain services, and the pressuring of interest groups. In the United States, there has historically been ambivalence toward democratic deliberation. Although the political system of the United States is designed to reflect and engender active citizens, it is also designed to protect administrative and political processes from a too-active citizenry. But, there are signs that may be changing. 3The need to prepare public managers with the knowledge and skills to be catalysts in building communities and engaging citizens in public deliberation is starting to receive increased attention in the literature of public administration and at professional meetings. This focus on the role of the public in public decision making is due to a number of factors. A primary factor is that the public is demanding greater involvement and accountability because of diminished trust (Parr and Gates, 1989). Even polls conducted since September 11, 2001 reflect low levels of public trust in government. A variety of diagnoses are offered to explain the decline in confidence in government: the role of money in politics, individualism, unraveling public morality, even television. Citizens, administrators, and elected officials have all become concerned about citizen cynicism and frustration with government. 4In addition to citizen disaffection with government, there are other cultural forces that are making public participation in public decision making more important. The information revolution, which has been transforming the workplace, is beginning to have a major impact on public policy making as well. Through new technologies, information is increasingly available in real time and in formats that make it usable to citizens. With access to information, more people feel capable of participating in government decisions that affect their lives directly. If the public’s demands for involvement are ignored, public decisions can prove meaningless in the face of public apathy or active opposition. 5Most of the tally messy problems that bother Americans – crime, drugs, school performance, racial and ethnic conflict, inner city decay, poverty – cannot be resolved by governments at any level unless citizens themselves are accountable, responsible, and engaged in helping to solve them. Crime prevention and deterring drug use begin with families and neighborhoods. If parents and neighbors are not enlisted in the effort to design, agree upon, and implement solutions, all of the well meaning interventions from outside will have limited, if any, impact. That is why, properly implemented, community policing has proven so effective. 6Local jurisdictions are mandated to involve citizens in public decision making. Public officials can choose to use their authority either to limit the role of citizens to appearances at pro forma public hearings or they can choose to design forums that bring citizens together to do the hard, noisy, messy work of community problem solving. It is public managers who do the work of designing and implementing public participation processes. Elected officials may request that a process be initiated, but it is the manager who makes it happen (Bramson, 2002). 7In order to engage the public in more productive public conversations, public managers must believe it is important to do so and have the understanding and skill to become effective conveners and facilitators. Professional public administration has contributed to today’s disconnect between citizens and government. Following the example of other professions in the early 1900’s, it assumed that the apolitical and rationalist application of expertise by a specialist afforded a much superior means to solving public problems. From this point of view, the public’s inferior level of information, relative to that of experts and professionals, and the public’s tendency to judge issues based on moral values, introduces random levels of subjectivity and misinformation into what should be an objective and well-informed process. Deferring to this presumed know-how of experts, citizens disengaged from active participation in public decision making adopting a “let the professionals do it” mentality. Engaging citizens in public decision making also requires knowledge and skills that have not traditionally been part of the preparation for careers in public administration, such as change management, systems thinking, community organizing, large and small group methods, facilitation and conflict resolution. 8Community leadership and public engagement present several challenges for the field of public administration, as it is currently constituted. It involves how we currently train public administrators and the way public employees are managed. Despite the need for public administrators to be more than technical experts, the current curricula of graduate programs in public administration still tend to center around technical preparation in such areas as personnel management, administrative law, finance, budgeting, and program evaluation. These skills are necessary but not sufficient for public management in the modern world, as demonstrated by the language found in the report of the National Association of Schools of Public Affairs and Administration Task Force on Encouraging Reform in State and Local Governments (NASPAA, 1993). That report recommends that programs provide skill development for new graduates in areas such as team building, leadership, negotiation, communication, employee and citizen involvement, cultural awareness, quality, and understanding how the media works. 9The need to prepare public managers to be community builders and designers and facilitators of public processes is also beginning to receive increased attention in the literature of public administration and at academic and professional meetings (Reich, 1988, Thomas, 1995, Frederickson, 1999, Cooper, 1991, Fox and Miller, 1995, Wamsley, 1996, Nalbandian, 1999, ASPA 2002 Conference Agenda). In the May/June 1999 Public Administration Review, John Nalbandian reports on a study in which city management professionals identified four changes that have occurred over the past ten years in their roles, responsibilities, and values. The article reports that community building is now seen as part of the public management professional’s role and responsibility and public managers are increasingly expected to facilitate participation and representation and to develop partnerships. In February 2003, the National Association of Schools of Public Administration (NASPAA) issued a call for papers on teaching civic engagement. 10The term “engagement” means that the people who are involved in a problem have a responsibility, working with others of differing views, to try to devise a solution that will work, and that will be accepted by most of those affected. William Ruckelshaus described this approach well in his 1996 Webb lecture at the National Academy of Public Administration, when he presented four or five instances, in which public administrators stepped back from their accustomed roles and served as facilitators and supports while citizens directly affected by a complex environmental problem hammered out solutions which all, or most, of them could accept. He then went on to observe: “Historically, public administration has prided itself on its ability to apply the tools of rationality to complex problems... I think that in the future many decisions will, rather, emerge from the sort of group processes I have been talking about... The role of the public administrator will be largely to foster the process and make sure that it has technical support...”. 11There are hundreds of case studies from communities all across the country, as well as internationally, where public professionals, primarily at the local level, are implementing the very process Ruckelshaus described. Through communal deliberation, decision making and action, they are solving crime problems, school problems, and problems of ethnic and racial conflict. However, despite hundreds of examples, the awareness has just begun to percolate up into federal and state political consciousness and the national media and to be reflected in university curriculum. Can we share these case studies and engage our students in learning from them? Can we accelerate the emergence of this new model of public administrator as a designer and facilitator of democratic processes? That is the challenge that had led Suffolk University in Boston to develop a new concentration in community leadership and public engagement for students in its Master’s in Public Administration Program. 12Suffolk University is located on Beacon Hill, in Boston, less than a block from the Massachusetts State House. Established in 1974, Suffolk’s MPA program enrolls approximately 150 students and is located within the Sawyer School of Management. Most of the MPA students are working professionals in the public sector or in not-for-profit organizations. The majority of the graduate classes are held in the evenings or on Saturdays. The faculty includes distinguished scholars, government officials, consultants, researchers and senior managers. 13In fall 2003, Suffolk University will begin offering students seeking the Master’s in Public Administration degree an option to concentrate in community leadership and public engagement. The goal of this new concentration is to develop a cadre of public professionals with the knowledge and specialized skills to design and lead participatory public processes and other multi-stakeholder decision making. The curriculum takes a multi-disciplinary approach to the theory, practice, and role of public managers in participatory community decision making. Students who complete this concentration should be able to demonstrate a fundamental knowledge of democratic organizing and participative public processes. Knowledge of the principles of change management, conflict resolution, group process, systems thinking, community organizing and democratic theory, as they apply to bringing together diverse parties in communities to forge new solutions. Ability to work with a group to analyze a community issue and design a process for engaging multiple stakeholders and evaluating results. Understanding of the importance of ethics and leadership in community change. Advanced level knowledge of models and methods for large and small group democratic processes. Application of process design and facilitation in an experiential setting. 15The curriculum in Suffolk’s new MPA concentration in community leadership and public engagement is intended to provide public management students with an educational framing for some practical guidance regarding how and when to engage citizens in public decision making – a framework for practice. Students take nine required core courses: public organizational administration, public policy analysis, financial administration, legal issues in public administration, quantitative analysis, human resource management, organizational effectiveness, and leadership as well as a capstone course. These required courses include key content areas which provide the foundation for the public engagement concentration (Appendix A). There are four required courses in the community leadership and public engagement concentration; major content areas in those courses are described below. In addition, students will choose four electives and will be encouraged to take two of those electives from other departments in the university (Appendix B). 16The public administrator’s most powerful tool for bringing the principles and skills of deliberative dialogue to the community is herself. No matter how many people a deliberative public process may eventually involve and impact, it begins with introspection. The way the public manager listens to people and the way she communicates in one-on-one interactions and in community meetings send a powerful message to citizens. In public deliberation citizens are engaged in examining their fundamental assumptions about their lives, community, and culture. If public managers are going to lead community members in this reflective process, they will need to do some hard thinking about their own values and assumptions and how they define their purpose as public service professionals. With this in mind, we have created opportunities for our students to reflect on their personal and professional purposes, beginning with the new student orientation and at several other points during the program. We have built coursework and experiential opportunities in leadership, interpersonal communication, emotional intelligence, group relations and conflict management into this concentration. 17Students who choose this concentration, will take coursework that examines a variety of civic innovations, that attempt to reap the benefits of citizen and public engagement by bringing together diverse parties – officials with clients, politicians with citizens – across a variety of policy areas. These cases come from areas as diverse as policing, the justice system, public education, environmental regulation and restoration, health care, social services, and economic development. In each case, practitioners have developed innovative institutional arrangements that invite the participation of ordinary citizens, devolve power to groups made up of these citizens and their “street level” public servants, even as they hold these groups responsible for producing and measuring outcomes. Students will analyze these programs drawn from the U.S. and abroad, in detail, focusing on their aims and accomplishments (or lack thereof) in terms of advancing the values of participation, fairness, deliberation, accountability, and effective governance. 18Students in this concentration will have “hands-on” opportunities to develop and demonstrate the competencies necessary to design and facilitate group processes for community learning. Required coursework provides an overview as well as specific practice in design strategies, techniques, and tools for involving members of groups, teams, organizations and various stakeholders – including the public – in defining problems, formulating policies or plans, making decisions, and implementing them. The coursework is designed to integrate the theory and practice of group facilitation, with a particular focus on community engagement. We do not seek to set forth a comprehensive theory of group facilitation but to describe a set of core values and congruent principle – elements of a theor – and show how to use various techniques to apply the principles in practic – with both small and large groups. No course can address all the situations in which public managers find themselves or all the designs or techniques they use to help groups in planning and in solving problems. That is why effective facilitators base their thoughts and actions on a model of effective groups and on models of diagnosis and intervention that are internally consistent. 19This course focuses on strategies for building strong community organizations, empowering ordinary citizens, and bringing about social and economic change. What do we mean by community? Why do so many Americans feel that community is lacking in their lives? What role should public managers play in empowering citizens and communities? What would we do differently if we really wanted to bring citizens, elected officials, and public managers together to solve community problems? 20Students in this course examine case studies and learn and practice community organizing strategies and skills. The course focuses on how to build organizations through which people can act on their common interests and emphasizes the asset-based approach to community building while contrasting that approach with problem-oriented approaches. 21Engaging citizens in community problem solving requires public managers to have knowledge and skills in negotiation and conflict resolution. Coursework in either dispute resolution or negotiation is required of all students in this concentration. In the negotiation course students are introduced to the theory and practice of negotiation. Effective negotiation involves a combination of analytical and interpersonal skills. Analysis is important because negotiators cannot develop sound strategies without an understanding of the context of the situation, the interests of all parties, and the range of possible options. Interpersonal skills are important because negotiation is fundamentally a process of communicating, building trust (or not), and mutual persuasion. 22In alternative dispute resolution, students learn guidelines for designing a dispute resolution system that will help handle conflicts effectively on an ongoing basis and avoid the damaging costs of attorney’s fees, lost productivity, and emotional injury. Students examine key questions to be answered when analyzing a dispute and principles of dispute system design, such as designing procedures than encourage disputants to return to negotiation. Distinctions are made amongst negotiation, mediation and arbitration and each is explored extensively. Dispute resolution is discussed in settings involving labor-management disputes, environmental issues, community disputes, construction claims, and business disputes. Special attention is paid to multi-stakeholder negotiations and public disputes. 23In order to examine the issue of citizen participation in community problem solving through the eyes of scholars in various disciplines and fields of study and to gain knowledge and skills not included in the public administration curriculum, students in this concentration will be encouraged to take selected courses in other departments of the university. The capstone course, which takes the form of either an internship (for per-professional students) or a practicum seminar (for in-service students) is designed to provides opportunities for experiential learning, working on real community problems and integrating research with action. 24Engaging citizens in deliberative and collaborative problem solving takes public mangers into new and challenging territory. It also raises difficult questions, such as: What personal skills and qualities are needed by facilitative public managers? On what issues do citizens need to deliberate? How do you create a public setting in which people will feel comfortable to talk openly? How can public issues be presented to citizens in ways that reflect everyday experience and what people really care about? What are the basic questions that public deliberation is best suited to explore and are there issues it is not suited for? How can public deliberation be made an ongoing, central aspect of governance? The courses in this concentration address these questions, and many more. Our purpose is to provide a framework for public managers, in thinking about when and how to involve citizens in public deliberation and multi-stakeholder decision making. 25In developing this program we have recognized some risks. We want to provide practical guidance that can encourage and give confidence to public managers in employing public deliberation in their communities. Public managers are implementers; they prize practical guidance. Yet reverence for technique and practical how-to’s generally emanates from a desire to control situations, which runs counter to the spirit of deliberative dialogue. Techniques can be used to mask manipulation. Skilled managers and facilitators, who master the techniques of participation, can use those techniques to design processes which give citizens the feeling that they have participated without promoting genuine citizen decision making or power sharing. When that happens, an approach that has the potential of changing citizen participation in government in fundamental ways becomes just a technique for cosmetic improvements in government as usual. And, ultimately, the public feels used, duped, and more deeply resentful than ever. 26Creating a culture of public deliberation is a dramatic departure from the customary way of doing citizen participation in government organizations. It is important to recognize that engaging citizens in deliberative dialogue involves systemic, transformational change, not just incremental improvements in public meetings and public hearings so that people won’t feel so unheard. Public deliberation has a larger purpose that is to change how both citizens and public officials think about government and about themselves and to change how they act. Deliberative dialogue requires a strong sense of commitment and purpose because often it is difficult to know what is really being accomplished. Sometimes changes in the community cannot be detected until after the process has concluded – sometimes long after. 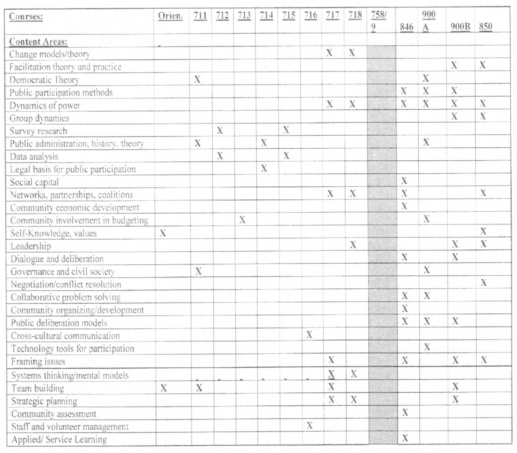 27The practices required for public deliberation cannot be mastered in a graduate program. They must be learned and improved over time. The skills cannot be learned by following a recipe or a series of how-to’s, as much as we might wish that were possible. Rather, it requires repetition with the understanding that one will always be learning. And, even with the concept of deliberation firmly in our minds, it may be hard to act that way. Most of our cultural messages are not about deliberating but about arguing (Kettering, 1988). 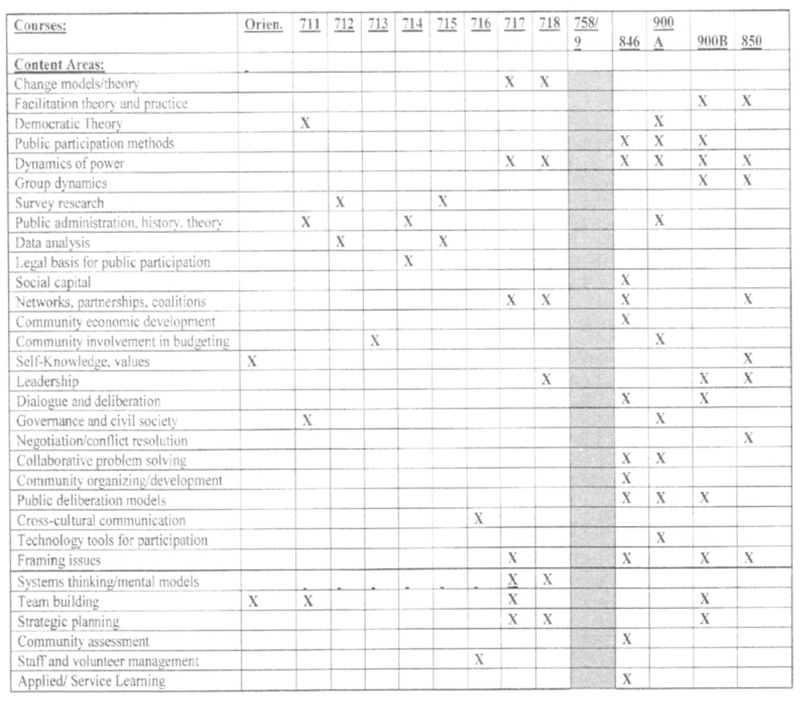 28Some of the skills needed by the deliberative public managers are very hard to teach. You cannot tell a pianist how to feel the music. Nor can you tell a medical student how to sense the story behind a person’s presenting medical problems so that she can swiftly perceive the underlying causes. But you can give the medical student an analytic framework and scaffolding in the form of a question protocol that leads her to discover this deeper understanding for herself. We are trying to begin constructing such a scaffolding for the deliberative public manager. 29Suffolk’s community leadership and public engagement concentration is the first of its kind in any MPA program, to our knowledge. This really is a case of ready, fire, aim! We expect to learn as we go, to modify the program through a process of continuous improvement, and to share what we learn with others. This new concentration is built on the foundation of years of professional experience and research, on the part of faculty members, and is the product of many months of planning and numerous faculty meetings. Yet, as we prepare to launch it, we have almost as many questions as answers: are we focusing on the right knowledge and skill areas? Can the interpersonal and communication skills necessary to be an effective community facilitator be taught? How accurate is our assessment of the market? When we build it, will they come? Will MPA graduates with this concentration be seen by employers as bringing added value to their organizations? How should we assess effectiveness? It is our hope that in developing and offering this curriculum, and sharing what we learn in the process, Suffolk University’s Public Management Department can contribute to a rethinking of the public manager’s role in communities and to the content and orientation of public administration education. Bramson R. A. , “Cultivating Productive Public Conversations: Enhancing Citizen Participation in Economic Development”, Economic Development Commentary, January 2002.
Cooper T. L. , An Ethic of Citizenship for Public Administration, Englewood Cliffs, NJ: Prentice-Hall. Fox C.J., Miller C.J. , Postmodern Public Administration, Thousand Oaks, CA: Sage. Fredrickson H. G. , The Spirit of Public Administration, San Francisco, CA: Jossey-Bass. Kettering Foundation. [June 1998], The Power of Public Choice. Nalbandian J. , “Facilitating Community, Enabling Democracy: New Roles for Local Government Managers”, Public Administration Review, (May/June. 1999), n° 59: 187-197. National Association of Schools of Public Affairs and Administration. , NASSPA’s Taskforce on Encouraging Reform in State and Local Government, Washington, DC. Parr J., Gates C. , “Assessing Community Interest and Gathering Community Support.” Partnerships in Local Governance: Effective Council-Manager Relations, Washington, DC: International City County Management Association. Reich R. ed. , The Power of Public Ideas, Cambridge, MA: Ballinger Publishing Company. Clayton T.J. , Public Participation in Public Decisions, San Francisco, CA: Jossey-Bass. Wamsley G. L., Wolf J. R. , Thousand Oaks, CA: Sage Publications. Suffolk University Master of Public Administration with a Concentration in Community Leadership and Public Engagement The 51-credit MPA concentration consists of 17 courses: 9 required core courses, 4 required courses from the concentration, and four electives from the concentration. Students in the community leadership and public engagement concentration are required to complete an internship or practicum employing action learning that involves working on real community problems and implementing solutions – learning by doing. PAD 900 (A) Civic Innovation, Community Engagement and Effective Governance In this course, students will examine a variety of civic innovations that attempt to reap the benefits of citizen and public engagement by bringing together diverse parties across a variety of policy areas to forge new solutions. PAD 846 Community and Citizen Empowerment This course focuses on the theory and methods for community organizing, community development, and community learning and explores ways empowered citizens can bring about social and economic change. PAD 900 (B) Public Involvement Strategies and Facilitation Methods This course is for those who wish to increase their knowledge of group theory and build skills for designing processes to facilitate complex situations, especially those involving community. The course provides opportunities for practice and feedback and for reflection that integrates knowledge and application. PAD 850 Alternative Dispute Resolution This course reviews all areas of Alternative Dispute Resolution: mediation, arbitration, negotiation, conciliation, mini-trials. MGOB 855 Conflict and Negotiation This course emphasizes the theory and skills of win-win negotiation. BRAMSON, Ruth Ann. 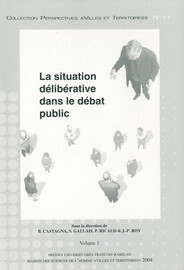 Ready, Fire, Aim: Developing a Program to Prepare Public Managers to Lead Deliberative Public Processes In : La situation délibérative dans le débat public : Volume 1 et 2 [en ligne]. Tours : Presses universitaires François-Rabelais, 2004 (généré le 21 avril 2019). Disponible sur Internet : <http://books.openedition.org/pufr/7190>. ISBN : 9782869065000. DOI : 10.4000/books.pufr.7190. Bramson, Ruth Ann. “Ready, Fire, Aim: Developing a Program to Prepare Public Managers to Lead Deliberative Public Processes”. Castagna, Bernard, et al.. La situation délibérative dans le débat public : Volume 1 et 2. Tours : Presses universitaires François-Rabelais, 2004. (pp. 151-165 -Vol. 2) Web. <http://books.openedition.org/pufr/7190>.